I am a conservative diver having only taken up scuba in the past 3.5 years, and in my later 50’s. It was something that I always wanted to do but was out of my reach until then. I am however, pretty active and healthy – I swim, walk and do pilates. 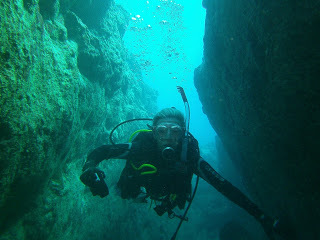 I have 80 dives to my history and have gone on several dive holidays locally and overseas. My dive profiles are always within no-deco limits. Two years ago I went to Thailand and dived for 4 days when I had my first encounter with DCI, although it wasn’t recognised as such at the time. After two dives, and on the hour long return boat trip to the mainland I noticed that I had a rash. It appeared first on my upper torso around my breasts and lower abdomen but then spread around my hips and towards my back. I then experienced some changing symptoms as one symptom left another emerged. At times I felt a little dizzy, I noticed my throat was very dry causing a dry cough for a few minutes and some wheeziness - not bad like struggling for breath but slightly shallower breathing was preferred. This then changed again and the dizziness returned. Just as we approached port after the hour trip back from the dive site, I noticed that my left arm around the elbow region felt numb, but this went away after about 1 minute. The main after affect was extreme fatigue and weakness. As I had been wearing shortie wetsuit with holes in it, the consensus of the dive instructor and the others from the dive shop was that I had an allergic reaction to stinging plankton that may have been trapped in my wetsuit. This theory was upheld because I had dived this location three days earlier and had experienced a similar rash although not as widespread, and a lesser degree of fatigue. I had dived other locations on the days in between with no ill effects or symptoms, so it appeared that there was some dive location specific marine life as the cause. I did not dive the next day and sought medical advice. My most recent experience was in the vicinity of Bundaberg region at Easter this year. Well firstly do not dive too soon after surgery of any type! I was keen to dive and was well ahead of my recovery from a knee arthroscopy, but in hindsight 4 weeks after surgery no matter how well you are recovering is far too soon. Only dive after getting clearance from your surgeon! The next factor to my DCI was that the first dive was across a scattered artificial reef and unfortunately there was strong current, which the dive instructor took us against for most of a very long swim. It was very strenuous for me and as I was also trying to take video I was often struggling to catch up with the others. The exertion was compounded by a long surface swim to the boat as well. The dive operator was aware that I was recovering from surgery so they were quite helpful in that I did not attempt to climb on board wearing my full kit, removing it while on the surface and my dive buddy handed it up for me. In all, the first dive was not well planned with poor visibility and unnecessary swimming and against current. The second dive for the day was considerably better but still required a lot of swimming. Later that afternoon I noticed that I was a little itchy around my waist but I had thought that perhaps the band from my BCD was a little too tight. Don’t ignore the itch! The dive shop announced that they were going out to the wreck the next day and my dive buddy was very keen to dive again. I wasn’t so sure about whether I should dive again because of my surgery (I did not at that time suspect any DCI), but agreed to go. Both dives on the day were terrific – so much marine life and no adverse conditions, and as usual dived a conservative profile. However, on the return journey in the small boat, it was a pretty rough kidney punch trip back to the mainland for about an hour. About halfway back I felt a little out of sorts…at first I thought it was that I was sitting in the corner and a little uncomfortable but began to realise that under my arms were aching. Then the slight cough began and the need to breath somewhat shallower. I did not feel ill at all but discomfort was increasing, and the itch around my middle was more pronounced and my breasts were aching. I realised I was not doing so well when we got ashore and I was trembling with weakness and fatigue. I could barely walk the distance to the toilets without puffing and feeling faint. After consulting with the dive operator I went to hospital where the staff there had no idea what to do. Intake at the hospital is a slow process and finally when taken to emergency, I was given the usual tests – blood pressure, blood taken (but not tested for several hours), heart monitor, ecg. I didn’t see a doctor for two hours. Finally we told her that I just need to be placed on oxygen. In hindsight we should have just told the nurses straight away. We also told the doctor to contactDivers Alert Network (DAN) Asia Pacific but for some reason she only go the number for the USA. The doctor called the Hyperbaric Medicine Specialist at the Royal Brisbane Hospital and we both spoke with him and I was to be given oxygen and to stay overnight. I felt relief about 30 minutes – the itch, and the pain in my breasts and under my arms were gone and after one hour I discharged myself against the hospital recommendations. They wanted me to stay for at least 6 hours. That was another error – I should have stayed! While I stayed overnight in Bundaberg I was extremely exhausted even after a good night’s sleep. I was still too week and fatigued to drive to Brisbane the next day and had to stay a further day. Even now, two months later, I have not regained my stamina despite exercising regularly. I find the weakness to be mainly in my arms and my swimming is still not as strong as it was before this latest DCI incident. The following week after my return home I saw Dr. Ken Thistlethwaite at RBH Hyperbaric Medicine Specialist Centre who gave me some very good advice. I had an overseas dive holiday booked and paid for, so I was encouraged by several people to get a dive medical, for which I would need a chest Xray. My GP in writing the referral also ordered me to get the echo bubble cardiogram. This test revealed a sizeable patent foramen ovale (PFO). Consultation with a cardiologist resulted in the prognosis that I was not to dive until I underwent the closure procedure later this year. I tried to see if a dive medical specialist would disagree, but my attempt for a dive medical was not successful with the specialist agreeing with the cardiologist. I am booked in for the procedure in July after I return from my overseas holiday where I shall only be snorkelling. Three months after the procedure, I will be required to undergo a further echo bubble cardiogram to detect that the closure has been successful and if so, after another 3 months I will take the dive medical so I can get wet again!!! (6 months after the procedure).